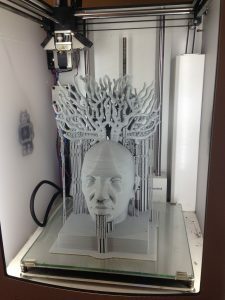 Depending on the technology used, there are many different materials that can be utilized for printing 3D objects. For example, FDM (aka Fused Filament Fabrication or FFF), one of the most popular and affordable 3D printing methods, commonly makes use of a thermoplastic filament but can also be used with materials ranging from ceramics, rubbers, metal alloys, and even edible materials. Other printing technologies available at Duke, such as SLA, make use of photopolymer resins that are cured via an ultraviolet laser. The Innovation Co-Lab Studio features over 60 3D printers available for use 24/7 during the semester. For more details please visit the Innovation Co-Lab Studio Website.